The order of play as a go term refers to the order in which plays are made (in a game position, or perhaps a problem or variation). If for example Black can play at A, which should be answered by White B, or at C which will be answered by White D, and the plays A and C are largely 'independent', then we can say there is an order of play question for Black, first at A or first at C? This will matter, perhaps, because after the A/B exchange White could answer Black C in some other way. Or in other words the order of play matters, because the verdict of a closer analysis is that plays are not as independent as might appear. Typically, the question of the order of play comes up when a player faces the question of which vital point to play in a local skirmish. Often it does not matter which to play first, but also often it does. This topic may be discussed from a number of general points of view, such as sente and gote relationships, timing, aji and aji keshi, and so on. There are also many subtle points special to particular areas. In books on joseki it is frequently pointed out that small differences in the order of joseki plays have important consequences. 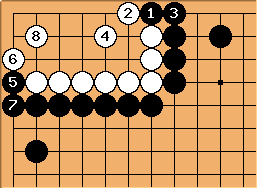 To become reasonably strong at go one should try to be sensitive to these points. Questions about order of play can be treated as part of a more complex discussion (involving timing and omission of plays). In this case, Black p is better than starting with Black q. Starting with p black gets a better result, because white has to defend at . White now has one point less than in the previous sequence, and black gets sente. If white tries to be smart by defending at directly, black will cut. 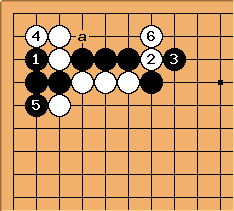 After this sequence, black can throw in at a and after white takes that stone, black plays atari at b and the white stones are lost. 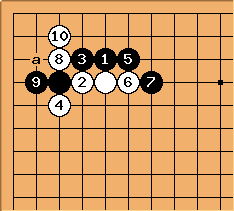 The sequence up to is the Onadare (Large Avalanche) joseki. At this point, black has several options. One of them is the move at a, discussed in depth at Large Avalanche - Turn Inward. After black plays a, there are important order of play issues. After , white must first play and not . 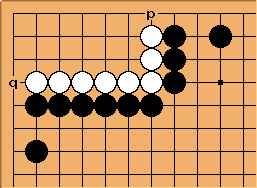 If white plays , black plays , reverting to a different joseki, Large Avalanche - Turn Outward, but with the - exchange giving black two extra points. After , white must first play and not . If white plays , black will respond at a and the resulting sequence will allow white to live just barely while giving black enormous influence. 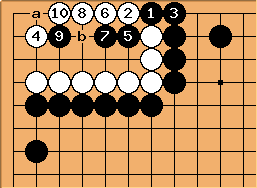 In both these cases, if white gets the order of play wrong, he will make a loss compared to the correct order. See Large Avalanche - Turn Inward for more in depth treatment. Bill: An amateur was showing a game of his to Lin Haifeng (Rin Kaiho) and said as an excuse for a mistaken line of play, "Well, I only got the order of play wrong." Lin replied, "Go is the order of play." hnishy: This expression (碁は手順なり Go wa tejun nari) is a Japanese Go proverb, not Lin's invention.